Dracaenas comprise one of the most important and diverse families of indoor foliage plants. The plant looks the same year round, with only the occasional dropping of a lower leaf. This makes these rugged, carefree houseplants popular for both home and office décor. This tender perennial is available in many different varieties, leaves can be oval or lance shaped and from 3 to 24 inches long. Very cold sensitive, the Dracaena is grown in the landscape in only the warmest regions (USDA Hardiness Zone 10-12). In northern climates, it makes a better house plant. In its native habitat, plant height varies from 3'-20' / 0.9m - 6.1m. The leaves vary in color from emerald green to red, often variegated with white or yellow stripes or yellow or cream spots. They have tufts of pointed leaves atop distinctly chevron-marked stems. Flowers are fragrant, small, and produced on stalks at the ends of the stems and followed by yellow-orange berries. Flowers and fruit are rarely produced on houseplants, however. 'Tricolor' with its red leaf margins and white band or stripe running down the green leaf has been around for years. This variety requires more light. 'Colorama' is similar in appearance and growth to `Tricolor' except it has red and ivory bands in the central section of the leaf. Both 'Tricolor' and 'Colorama' have less chlorophyll than the common green species. They are slow growing and require lots of light to live indoors; however, they will tolerate lower light levels. A plant seen in stores being sold as "Lucky Bamboo" is actually dracaena sanderiana. The Dracaena is drought tolerant. Water when the soil surface is dry to the touch and then water them thoroughly. Keep the soil evenly moist, but not wet; excess dryness or water will cause leaf tips to turn brown. If planting in the landscape, select partly sunny to partial shade locations with well-drained soil. Like most tropicals, Dracaenas thrive in higher humidity conditions. Setting the container on a tray of moist pebbles will help elevate the humidity. 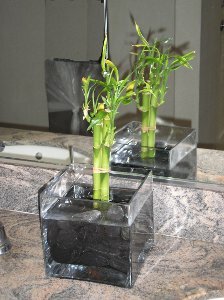 As always when using trays of stone, do not let the plant sit in the water. If the humidity in the house is below 30 to 40 percent (it probably is during winter), plants will also benefit from an occasional misting of their foliage. When it comes time to repot, a standard commercial houseplant potting mix may be used. Feed Dracaenas with liquid foliage plant, or timed release pellet, fertilizer. Feed every month in spring and summer with a 10-10-10 fertilizer. This exotic house plant is slow-growing, but can reach 6 feet (1.8 m) or more indoors. You can control its height by simply cutting off the top. Pruning should be done in the spring or early summer when the plant is at its peak growth. You can cut the cane at any height, and within weeks, it will sprout a new cluster of leaves from where it was cut. Mealy bugs can be a problem with dracaena's as well as scale insects and spider mites. These can be easily treated with a systemic insecticide that contains imidacloprid or insecticidal soap. Regular misting with water will also help, doing double-duty, raising the humidity and keeping the pests away.